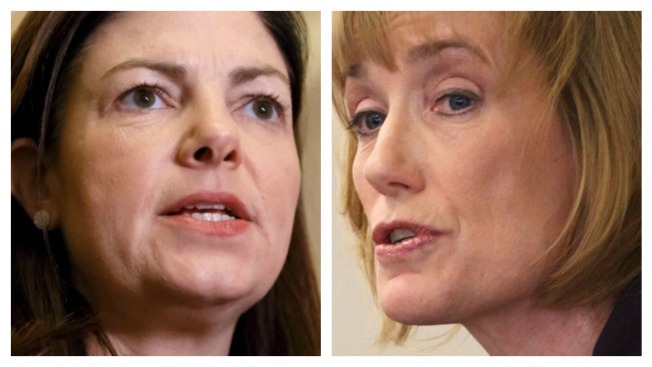 Kelly Ayotte, left, and Maggie Hassan. New Hampshire Gov. Maggie Hassan isn't letting anyone forget U.S. Sen. Kelly Ayotte's past support for Donald Trump, and Ayotte is accusing Hassan of taking false credit for the state budget. Ayotte is a first-term Republican who is being challenged by Hassan, a Democrat. In a debate Friday, the incumbent argued that Hassan's veto of the budget delayed the delivery of critical funding to combat the state's opioid crisis. Hassan responded that she had to veto the budget because the numbers didn't add up and that there is plenty of credit to go around for what eventually passed. She told WGIR radio listeners that Ayotte showed a concerning lack of judgment in supporting Trump. Ayotte, after calling Trump a role model, has since withdrawn her support for her party's presidential nominee.